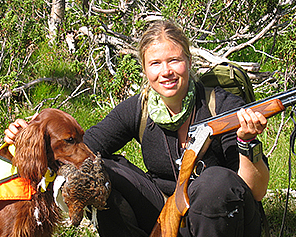 The founding idea of my business is combining hunting and outdoor activities with the themes of health and wellbeing. 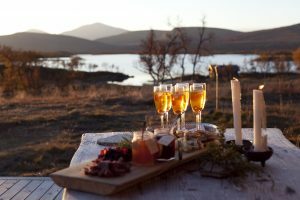 Apart from purely hunting packages, I offer interesting health-themed activities in combination with hunting. I am convinced that the external environment affects our wellbeing to a much greater extent than we believe. Using nature as a resource for recovery when you are tired and stressed, for inspiration when your ideas have run dry and you find it difficult to focus, for recreation when you need a chance of scenery… these are fantastic opportunities! I can offer a range of variations on this theme. With the help of modern research reports on the subject of “green rehabilitation”, I have described how this can be part of my activities. You are welcome to contact me for more information about green rehabilitation. 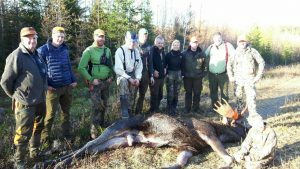 I am authorised as a hunting guide via NJA (Norrland’s hunt organisers) and have many years of experience of different types of hunting. My primary field of expertise is hunting over pointing bird dogs. I have two Irish setters, Zero and Shiva. I cooperate with other dog handlers who guide alongside me. The guides I hire for my hunts are hunters with different dog breeds, which means that you can also hunt with Gordon setters, vorstehs and pointers. Welcome to JoyEvent Hunt and Health!